This photograph shows the Main Convent School (previously known as Convent of the Holy Infant Jesus). The school was founded by Mother St Victoire, supported by Mother St Anatoli, Assistant General to the Priests' Assembly in Paris. The school was opened on 7th January 1907, by Mother St Anatoli, at a small house in the compound of the St Michael's Church (Ipoh), with only eight students. Initially, it had only two teachers, Sister St Anne and Sister St Stanislaus, headed by headmistress Sister St Prudence. Open to both boys and girls, the enrolment of the school increased to 98 students by the end of that year. The government then contributed $7,500 towards the construction of the first timber building at Brewster Road, with chapel, school office and Sisters' quarters. Over the years the Sisters have been of various nationalities, Irish, French, Italian, Eurasian and Malaysian. 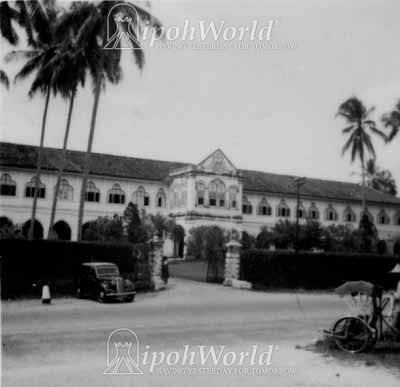 They served as teachers in the school, nurses in the orphanage (now known as Asrama Bintang, Home for the Needy), supervisors of the boarding school and of course, housekeepers, gardeners, cooks and the like, necessary to run the establishment. At one time they all lived in the Convent House, but in 1992, with numbers down to five, they took up residence in Pasir Puteh South. The finest buildings in the Convent complex are the front block from 1927 (facing Brewster Road), the middle block from 1929 and the back block from 1935. The blocks are all linked together by a maze of corridors and covered galleries framing quadrangles for sports and games. The front block (see the picture above)presents a dramatic facade with Neo-Gothic arches and trefoil shaped window openings with timber shutters. A third of this block was originally occupied by a magnificent chapel with high ceilings and columnades, illuminated with five panels of exquisite stained glass, which has since been removed. It was a sanctuary for prayer and meditation, which celebrated its last Catholic Mass in 1991 to mark the retirement of Sister Chew (see below), the last missionary Principal of the school. However the chapel complex remains and is regularly used for music and other activities including Friday night prayers by a Christian group. Four students passed the Standard Seven Examination in December 1909; and one candidate for the Junior and two for the Senior Cambridge Examinations in 1915. In response to appeals from parents, in 1910 the Convent erected a Hostel block to which pupils of all denominations were admitted. In 1913, with the opening of St Michael's Institution in the previous December, the boys were moved to SMI and the convent became a 'girls only' establishment. Mother St Marcellin became the Principal in 1922, and brought the school up to par with other Convent schools in Malaya. The curriculum was aimed at preparing students to become future good wives and mothers and to this end, as well as the normal scholastic subjects, included social skills, inviolvement in welfare work and excelling at handicrafts and needlework. In 1927 and 1929 two extensions to the school had to be made to cater for the ever increasing numbers of pupils and in the 1930's the curriculum started to concentrate more on academic achievement - a sign of the changing status of women in the community. During the Japanese occupation the building was taken over by the invaders and used first as a Nippon Go Teachers' Training School and later as a Gakko. Closed for three years and eight months, the school reopened on 27th September 1945, just 25 days after the Japanese surrendered. 1947 marked two milestones in the school's history: Science was included in the curriculum for the first time, setting up of the laboratories being managed by Sister St Oliver; on 21st May that year the first Old Girls' reunion took place and their Association COGA (Convent Old Girls' Association) was formed. The 1950's brought many changes: in July 1950 the students were divided into houses for the first time to encourage participation in competitive sports; on 3 February 1955 the first school magazine "Via" was published; in 1959, the first Board of Governors was set up; at an unknown date the school became known as "The Main Convent, Ipoh" to distinguish it from sister convents that were being established, these being partly funded by functions put on by Main Convent. In the 60's and 70's changes continued: in 1965 Tarcisian Convent, housed and eventually took over some of the classes as Main Convent could not handle the ever increasing numbers: despite this, afternoon school had to be brought in at the beginning of 1968 due to lack of space; in 1976 Malay replaced English as the medium of instruction and in 1978 the first batch of form three students sat for the SRP examination. In December 1991 a major change took place when Sister Maureen Chew took optional retirement from the post of Principal, which she had administered since 1973. Her services to the community had been recognised a full ten years earlier when, on 18th September 1981, the Sultan of Perak had awarded her the Pingat Jasa Kebaktian (PJK). She was replaced by Miss Khoo Gim Keat in January 1992. The administration by missionary sisters had ended after 84 years! In this photograph from around 1952, an old car and a trishaw can be seen waiting outside the school.